Let’s play a game. Ready? I’ll show you an object and you try to guess its mass. We’ll play three rounds. To start, play the video below, pausing when instructed. What you just experienced is part of something I call an Emerge lesson, which slowly reveals information to learners (the full version may be found here). Lessons like these can make a game of math, infusing the learning process with fun. Lessons like this focus on the relationship between two real, concrete quantities. In this case, the quantities were the number of cubes and the total mass of the cup and cubes. Because this lesson reveals small amounts of information at a time and allows learners to process each bit before moving on, the hidden mathematical relationship between the quantities emerges for learners in a natural way. Emerge lessons use actual physical materials that are directly measured to reveal the information. They are not word problems or hypotheticals. They are real and tangible. The materials can be anything so long as their properties are related and can be measured or counted. Game mechanics are useful in teaching math because they heighten emotion, engagement, and attention at each phase. Because they include music, student teaming, and point systems, Emerge lessons are succinct, fun activities. Students smile and cheer when I tell them we’ll be doing one, and many students have asked if they could eat their lunch in math class to finish a lesson. In addition to increasing engagement, gamifying math lessons allows students with different levels of comprehension to participate and learn. Students with lower levels of skill can make guesses based on intuition and common sense. Students with higher levels of skill can use more sophisticated strategies like writing functions to model the relationships. This also means that the same lesson can be used to teach students at different grade levels by adapting which formal mathematical tools are introduced. 1. Introduction: In this phase, students are grouped into competitive teams and introduced to the materials that will be used in the game. This can be done with a video like the one above, or by physically demonstrating with the actual materials in the classroom. Students are told two quantities to be measured and which one they will be responsible for guessing. 2. 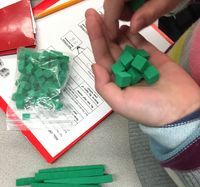 Physical exploration: In this phase, students play multiple rounds of the game, trying to guess the value of one of the quantities when they know the value of the other. Each round, before making their guess, teams are asked to discuss strategies and come to a consensus within the team. The collaborative nature of the work builds rapport between students. It also allows students to listen to and learn from each others’ mathematical perspectives. Students record their thinking on a whiteboard so that it can be shared with the group. 3. Student presentation: After guesses are made for the last round, the teacher facilitates a student-led class discussion about the various insights and strategies the teams used. Each group’s whiteboard summary serves as a visual representation of their thinking. The best discussions are the ones that make connections between the intuitive methods and the formal methods. 4. Formal learning: In this phase, the teacher provides the students with some direct instruction on how to model the relationship using a predetermined method that is applicable to the course they are teaching. A fifth-grade teacher doing the “Cubes in a Dixie Cup” lesson might treat it like a multistep operations problem where students use decimal operations to find the mass of the cup. In an Algebra 1 class, students might graph the data. They could find and interpret the slope and y-intercept of the linear function that models the data, then use that function to make the predictions. During a gamified lesson, assessment happens at multiple stages. As students record their thinking before each guess, the teacher can circulate and have conversations with students about their process. During the formal learning phase, guided and independent practice provides opportunities for assessment. After the formal learning phase, I often play a few more rounds with the concrete materials. This allows students to try out their new learning in the same context in which they began.